The term refers to a gas that is formed in the upper atmosphere and also at the ground level. In the upper atmosphere it is a natural constituent of the atmosphere and plays a critical role in preventing ultraviolet B radiation from reaching the ground. Such radiation causes skin cancer and can harm plant life. Certain chemicals, particularly chlorofluorocarbons, used in refrigerators, aerosols and cleaning supplies, destroy the ozone protection. The Montreal Protocol was formed to phase out the production of the substances destroying the ozone layer in the atmosphere. This Protocol is one of the most successful international agreements to protect the environment, and has begun to restore the protective ozone layer. 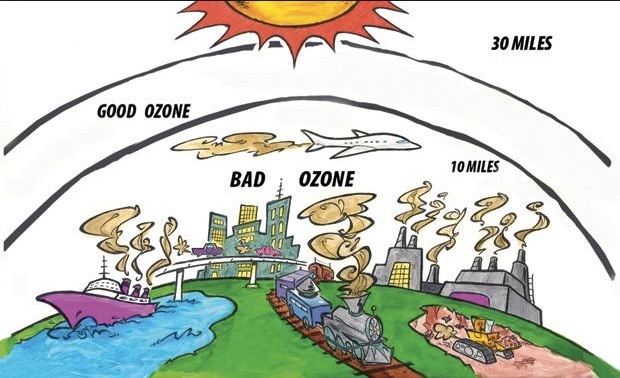 At ground level ozone is formed by chemical reactions between oxides of nitrogen (NOx) and volatile organic compounds (VOC) in the presence of sunlight. The NOx and VOCs are produced from industrial facilities, electric utilities, motor vehicle exhaust, gasoline vapors, and chemical solvents as well as other sources. At the ground level this ozone is a pollutant and is part of what makes smog. There are numerous health risks from inhaling ground level ozone, including chest pain, difficulty breathing, even scarred lungs and aggravation of asthma and other respiratory diseases. Since one of the sources of ground-level ozone is vehicle exhausts, there are many difficulties in regulating this source although there are efforts to change the mix of fuels and engine modifications, including electric cars. Identify some of the sources of ground-level ozone affecting your community. Determine what corrective action can be taken to reduce or eliminate these sources. 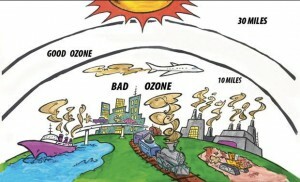 Identify some of the products that are destroying the ozone layer in the atmosphere. Determine what further action is necessary to phase out or ban these products.